Wied il-Mielah valley is located in Gharb, north-western corner of Gozo island. 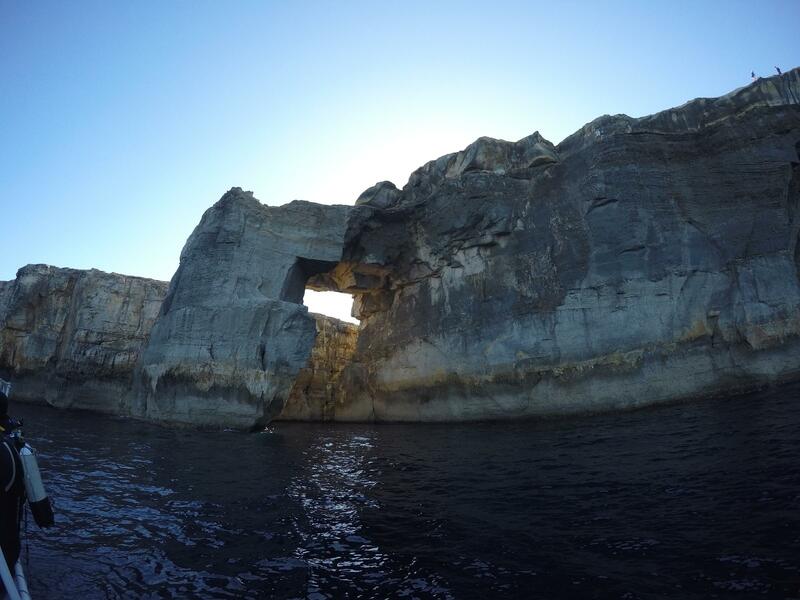 Wied il-Mielah Window (It-Tieqa ta’ Wied il-Mielah) is a natural megalithic archway over the sea similar to Azure Window was in Dwejra before its collapse in 2017. The dive site in Wied il-Mielah is currently accessible only by boat. Diving under the arch of the window towards the valley leads into a beautiful large cave with an air pocket. The depth of the cave entrance is around 16 meters. From the foot of the arch west / west north west at depth of 12 meters there is about 30 meters long reef. Between the reef and the wall the depth drops to 18 meters, and there is a nice swim through under the rocks. West of the window there is another very nice cave/crack at 20 meters that is open up to surface. This cave has great scenery and is very photogenic. Further west the wall drops to 18-20 meters and the sea bed slopes down with some boulders. Straight out from the archway into the blue at about 30-35 meters a shoal of barracudas is often seen. East from the window the wall drops to 50 meters and more. ★★★★☆ Caves and cavers close to the shore are really nice, but there is very little to see further out.